What is the Progressive Employment Model? The Progressive Employment (PE) model is an employment strategy with an emphasis placed on how VR business relations and job placement personnel interact with employers. PE is predicated on a dual-customer philosophy, making information about business engagement key to better serving VR consumers in finding work experiences while ensuring employer needs are optimally met by the VR program. The PE model is fundamentally based on the premise that businesses should be partners and clients of VR for the process to work most effectively. Adoption of the “Everybody is Ready for Something” Approach: Work experiences boost confidence, increase motivation to complete VR, and introduce employers to potential future employees. Early work experiences provide vocational evaluation information while increasing motivation for consumers. Full array of work experiences: These include low and high dose strategies such as job tours, mock interviews by employers through to 6-week work experiences and internships. Focus on jobseekers with intensive pre-work needs such as those with multiple significant disabilities, criminal justice involvement, behavioral disabilities, and poor work histories. Rapid Engagement in Real Life Work Settings with a reduction on “job readiness” assessments and evaluations. Creating a “business as customer” delivery system: Engagement with employers is characterized as a sales approach that seeks to serve the business’s current and future employment needs. Employer Risk Reduction Options that include options for liability and worker’s compensation coverage for employers and sources for stipends. Employer Tracking Database: An ever-expanding employer database is maintained that includes employer specifics, and their levels of availability for providing work experiences. PE as a team approach with emphasis on rapid engagement. View a presentation describing what we have learned from the PE model evaluation and replication to date. What is Unique about the Progressive Employment Model? For VR Systems: The PE team approach emphasizes greater employer interaction and responsiveness to employer needs, and more rapid work engagement for consumers. The model requires a more team-focused approach to VR service delivery to businesses as clients. A Team Approach to Service Delivery that includes the jobseeker, employer, counselor, employment specialist and a business account manager. The employment specialist has greater autonomy than usual in creating work experiences based on consumer interests. Rapid Communication of Labor Market Intelligence in which all teams share information across jobseekers and employers for the expressed purpose of being able to identify matches and opportunities. Contact us to learn more about the success of the model for Vermont’s VR system. For VR Consumers: PE helps consumers who have little work experience, criminal backgrounds, multiple disabilities, etc. overcome barriers to employment. Career exploration: PE allows consumers to gain work experience/ exposure in a desired career field(s) gaining references, feedback from employers, building skills, and may lead to employment offers. Here are some examples of various PE situations that assisted a range of job seekers to gain experience, confidence, and business connections. For Employers: PE is “no risk, low-risk” approach to accessing and interacting with job candidates. 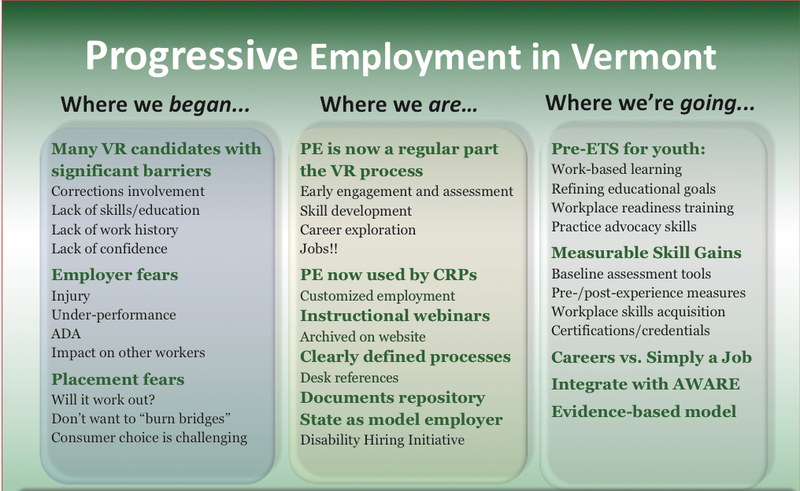 In collaboration with the Vermont Division of Vocational Rehabilitation (DVR), the Institute for Community Inclusion is engaged in an exciting research activity to replicate and evaluate the Progressive Employment model (PE). The learning collaborative will allow the replication of this model in other state VR agency settings to study the impact on employment outcomes for people with disabilities. The basic components of the Learning Collaborative include: 2 to 4 in-person meetings per year, and regularly scheduled monthly telephone/videoconferences; on-site, phone, and email TA from Vermont DVR and ICI staff; and, wrap around research and evaluation embedded in activities. The five participating state VR agencies are: Vermont Division of Vocational Rehabilitation, Florida Division of Blind Services, Maine Division of Vocational Rehabilitation, Oregon Commission for the Blind, and Nebraska Division of Vocational Rehabilitation. Diane Dalmasse, Director and Hugh Bradshaw, Client Services Manager, and their teams originated the VTPE model in a small rural state. VT employment specialists and business account managers focus attention engaging and relationship building with local small businesses. VT DVR believes that VTPE offers a series of placement options geared to the skill level of the individual and needs of the business, for example company tours, job shadows, and short-term work experiences. VT DVR has eliminated the idea of “job ready” to state that “everyone is ready for something” and moves evaluation and assessment into real work settings. Mark Schultz, Director. The VTPE focus in Nebraska is in the area of “rapid engagement” and has been renamed “The Meet You Where You Are” Model. For clients in the replication model, the average time from application to work experience placement is about 34 days – usually before the IPE is formalized. Nebraska VR has hired 4 Business Account Managers (BAM) responsible for employer engagement and who carry an “employer caseload.” Nebraska VR is the only Learning Collaborative participant that provides employment services directly. View Nebraska VR's Pathway to Employment Video Series. DOWNLOAD THE FULL MODEL REPLICATION AND EVALUATION REPORT [WORKING PAPER]. View highlights from the 2017 working paper. Betsy Hopkins, Director. Maine BRS serves 10,000 consumers per year in a predominately rural state. One third are transition-age youth and the VTPE replication is specifically targeting this population. BRS relies on CRP’s for job placement and are actively working with CRPs as part of the effort. There is one BAM for transition students in the state, and his primary responsibilities are coordination of team meetings about VTPE and contact with larger employers and big box stores. Listen to Maine BRS's radio interview about the success of the Progressive Employment Model for their youth with disabilities. View Maine's presentation on Progressive Employment and Work-Based Learning with Jobs for Maine’s Graduates [PPT]. Angel Hale, Director. Oregon CFB works in partnership with businesses throughout Oregon who are committed to hiring/retaining VR consumers who experience vision loss. The main VR office in Portland is piloting VTPE for blind and/ or low vision transition-age youth consumers who have barriers to maintaining employment. Oregon CFB has one Business Account Manager who works to establish meaningful relationships with businesses and host meetings pertaining to VTPE job development and placement. View an Oregon Commission for the Blind consumer success story. Robert Doyle, Director. DBS is a large blind agency providing a range of services for persons with blindness and visual impairment. A few field offices are piloting VTPE and engaging consumers who have been receiving VR for two years or more without recent progress. Each field office has one or more Employment Program Specialist (EPS) whose responsibility is job placement.